Barbara J. Lightfield, 85, of Burlington, passed away Monday, January 28, 2019 at her home. Born in Grinnell, Iowa on November 5, 1933, she was the daughter of Milo and Marie (nee Weidman) Reavis. She spent her early life in Iowa and Burlington, Wisconsin where she graduated from Burlington High School. On September 13, 1958 in Shawnee Town, Illinois, she was united in marriage to Theodore Lightfield. Following marriage, they made their home in Burlington where they raised their family. Theodore preceded her in death on June 30, 2003. Barbara has been a resident of Burlington for 55 years. She worked in the bakery for Schmalings Grocery. 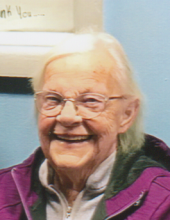 She was a member of St. John’s Lutheran Church and loved spending time with her family. Barbara is survived by her children, Theodore (Linda) Lightfield, Pam Lightfield, Charles (Susan) Lightfield, Beth (Brian) Saunders and Sandi (Todd) Thelen; grandchildren, Tyson Delgado, Jeremy Delgado, Jason Delgado, Justin (Allison) Delgado, Jennifer (Rob) Mussa, Ted (Amanda) Lightfield, Cory Lightfield, Nancy (J.T.) Heinzelmann, Zaccary Thelen, Bailey Thelen, Caitlin Lightfield, Hannah Lightfield, Tyler Saunders, Rachel Delgado and Amber Pheiffer; great-grandchildren, Dillan, Braedan, Raelyn, Paxton, Ronin, Deckard, Jaxson, Paige, Brooklynn, Teddy and Hailee; and siblings, Jerry (Marion) Reavis and Gary (Sue) Reavis. Barbara was preceded in death by her parents, husband, siblings, Jim Reavis, Robert Reavis, and Beverly “Jean” Landsness; and father and mother-in-law, Vern and Hattie Lightfield. Memorial contributions may be made to the family, Vitas Healthcare or Burlington Rescue Squad. A memorial service will be held on Saturday, February 2, 2019 at 2:00 PM at Schuette-Daniels Funeral Home. Relatives and friends may visit with the family at the funeral home from 1:00 PM until the time of service. A burial will take place immediately following service at Hickory Grove Cemetery. To send flowers or a remembrance gift to the family of Barbara J. Lightfield, please visit our Tribute Store. "Email Address" would like to share the life celebration of Barbara J. Lightfield. Click on the "link" to go to share a favorite memory or leave a condolence message for the family.